James Harden sat outside the visiting locker room in street clothes after the Houston Rockets’ playoff win when the team’s media relations manager apologized for the delay. The NBA MVP candidate was patiently waiting on teammate Nene to get dressed so they could take part in the postgame news conference. “Nene can take as long as he needs, the way he played,” Harden responded. 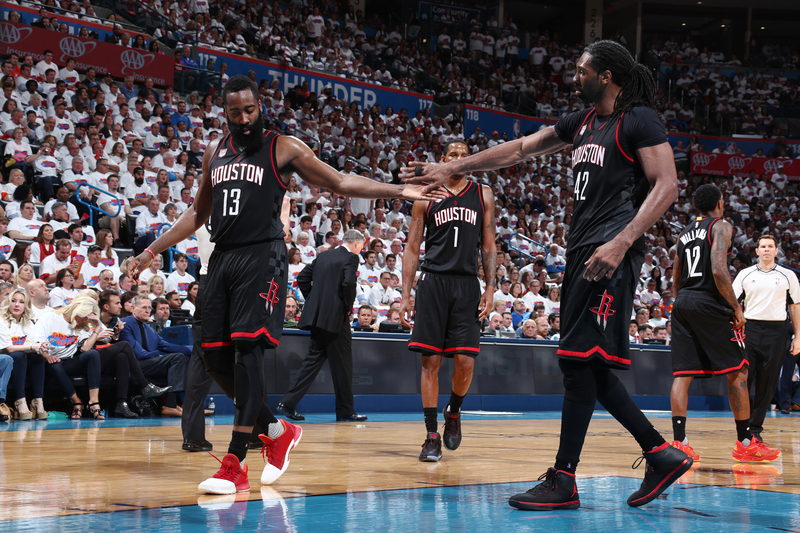 Nene scored 28 points on perfect 12-of-12 shooting from the field as the Rockets beat the host Oklahoma City Thunder 113-109 on Sunday to take a 3-1 lead in their first-round series. The Brazilian also grabbed 10 rebounds, made four free throws and earned a 3-point play late in the Game 4 win. Nene’s perfect shooting on 12 attempts tied a playoff mark set by Kansas City/Omaha Kings forward Larry McNeill on April 13, 1975, against the Chicago Bulls. The Rockets can win the series Tuesday in Houston. The bruising and athletic big man is known simply as “Nene,” which means baby in Portuguese. His birth name is Maybyner Rodney Hilario. After a successful three-year stint playing in Brazil for Vasco da Gama and with the Brazilian national team, he was invited to the NBA pre-draft camp in Chicago in 2002. The 6-foot-11, 250-pounder intrigued then-Nuggets general manager Kiki Vandeweghe when he worked out for the franchise in Denver before the draft. The Nuggets selected Nene with the seventh overall pick in the 2002 NBA draft, making him the first Brazilian picked in the first round. The 2003 NBA All-Rookie first-team selection averaged 10.5 points on 51.9 percent shooting, 6.1 rebounds and 1.6 steals his first season. Nene also learned English on his own and speaks it relatively well, although he would like to take lessons when time permits. Nene and Atlanta Hawks forward Mike Dunleavy Jr. are the only first-round picks from the 2002 draft who are still in the league. Rockets associate head coach Jeff Bzdelik, Nene’s first head coach in Denver, told The Undefeated he was impressed by the Brazilian’s physical tools, athleticism and more. “I’m in awe of people who come here from another country who learn to adapt. It says so much about who they are as a person and how tough, persistent and dedicated they are,” Bzdelik said. Houston Rockets center Nene Hilario (No. 42) drives to the basket against Oklahoma City Thunder center Enes Kanter (No. 11) during the second quarter in Game 4 of the first round of the 2017 NBA playoffs at Chesapeake Energy Arena. Nene has averaged 12 points and 6.3 rebounds in 15 seasons with Denver, the Washington Wizards and the Rockets. He also has had his share of injuries. He missed 23 games to various ailments during the 2004-05 season and all but one game in 2005-06 after suffering a torn right ACL during the season opener. He was limited to 37 games in 2007-08 after suffering a thumb injury and overcoming testicular cancer. Nene temporarily shook off the injury-prone label when he averaged career-highs of 14.6 points, 7.8 rebounds, 1.3 blocks and 1.2 steals in 77 games during the 2008-09 season. After playing 82 and 75 games the next two seasons, respectively, he has never been able to play more than 67 games in a season. With so many games lost to injury, Rockets head coach Mike D’Antoni said “without a doubt” it affected Nene’s career success. The Rockets needed a veteran center to mentor and share time with Clint Capela after Dwight Howard departed last offseason. 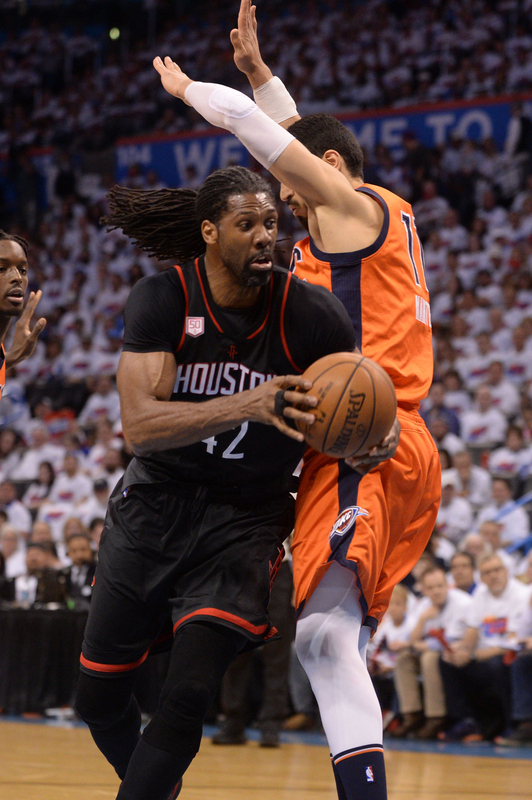 Nene averaged 9.1 points on a career-high 61.7 percent shooting and 6.3 rebounds in 67 games this season. Nene told The Undefeated he contemplated retirement before signing with the Rockets. Good health, respect from teammates and success on the court have him loving basketball again. D’Antoni and Bzdelik said much of Nene’s success comes from being healthy and eating right. “I enjoy playing with these guys. It’s a great group. The franchise is amazing. I just have fun,” Nene said. Nene joined forces with sharpshooters Eric Gordon and Lou Williams to give the Rockets some potent reserve punch. Nene was a saving grace in Game 4 as Capela struggled with four points and five rebounds in 17 minutes. D’Antoni believes a healthy Nene is the best center in the league. Nene belongs to the Christian faith. He has said God used his testicular cancer scare to test his faith and prepare him for being a servant to mankind. He attends Second Baptist Church in Houston, and after retiring he plans to be more involved in church charities in Brazil. Nene believes his success comes from God and he pointed to the heavens after the Rockets won Game 4. “Every time when I wake up and I breathe, it’s because of my faith,” Nene said. “When you don’t wake up from sleep, you’re dead; when you wake up, you’re alive. That’s the truth. I grew up in the church. That is my way to escape by God’s mercy. He always brings us to his side. It doesn’t matter. You can’t escape it. Rockets forward Ryan Anderson said Christianity bonded Nene and himself this season. “The guy loves God and has a real personal relationship with God,” Anderson told The Undefeated. “We connect on that level. This is a game. This isn’t everything in life. When we leave the court, we have lives where we can do important things. He wants to use his platform to give glory to God. I’d like to do the same thing. James Harden (No. 13) and Nene Hilario (No. 42) of the Houston Rockets react to a play during Game 4 of the Western Conference guarterfinals of the 2017 NBA playoffs on April 23 at Chesapeake Energy Arena in Oklahoma City. Nene’s spark of a game helped ease an off game for Harden, who finished with 16 points on 5-of-16 shooting. While Harden is the star and the face of the Rockets, he views Nene as a role model and a mentor.